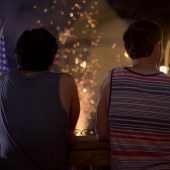 A road trip movie that brings together three childhood friends, including one who’s gay and closeted. They’re going to their primary school reunion. Along the way, the past wrongs, taunts and laughs are re-lived and exposed as having lasted a lifetime in these 40 somethings. Shot on a mobile phone. Audience and Best Film Award winner at Morelia, Hermosillo, Cinelatino Film Festivals. Ariel Award Winner (Mexican’ Oscars) for Best Actor. Marcelo Tobar was born 1977 in Distrito Federal, Mexico. He is a writer and director, known for Asteroide (2014), Oso Polar (2017) and Drenaje Profundo (2010).